The Princess Theatre Center for the Performing Arts is looking to other historic theaters for guidance on how to revive interest in its downtown Decatur performance space. Chenault, former board chairman Bill Briscoe, friend of the theater and retired Judge David Breland, program chairman Ron Simmons, and local musician and sound engineer Chris Kemp traveled to Franklin this month to tour the theater and talk with its staff. “Our takeaway was, of course: We need to do better. But we’ve known that for a while,” Chenault said. “We know it’s not going to happen overnight, as much as we would like for it to, but we just have to start somewhere.” Chenault said he hopes to visit several other theaters during an April trip to Florida. 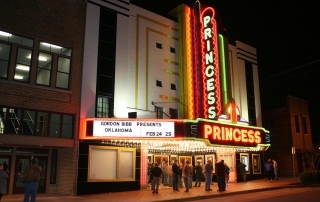 Franklin Theater Director Dan Hays said the 300-seat theater — less than half the size of the 677-seat Princess — has a $1.5 million budget — nearly triple that of the Princess. But only about 15 percent, or $225,000, comes from donations, while the rest is made on rentals and box office and concessions sales, Hays said. The theater is owned by the nonprofit Heritage Foundation of Franklin and Williamson County. It receives no government funding, Hays said. About half the Princess’ $675,000 annual budget is contributed by the city, county and other donors, Chenault said. About $2 million of the Franklin Theatre’s revamp budget was spent on state-of-the-art sound and lighting equipment to make it a first-rate music venue, he said. Chenault said the Princess delegation also learned some things from the theater’s “extremely well thought out and professional” concessions design. “There was a separate beverage area upstairs, so if you were seated upstairs you didn’t have to walk back downstairs to get a beverage. Convenience of the patrons was in their mind when they designed the theater,” Chenault said. Chenault said the Princess has never focused heavily on concessions, but is trying to change that mentality. About 450 of Franklin’s events each year are movies — something Chenault said he has always wanted the Princess to feature. He conjured an image of young adults and children who have never passed beneath the brilliant, multicolored marquis, doing so for their first time to watch a Saturday morning movie — perhaps dressed up to match the theme of the movie — and buying popcorn and drinks at the concession stand. The Princess would mostly show older movies, Chenault said. Hays said the Franklin Theatre also hosts a variety of community and children’s events. Renting it out to charities brings in another 30 music events each year on top of the ones produced by the theater, he said. “We kind of think of ourselves as Franklin’s living room,” he said. Hays’ words echoed the advice strategist Susan Palmer of Palmer Westport Group, a consulting firm specializing in historic theaters, had for the Princess: Become Decatur’s living room. Palmer has been hired to help the Princess identify its goals and formulate an operating plan. Chenault is expected to provide a progress report to the City Council next month.